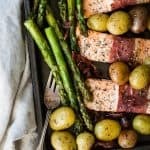 Another super easy sheet pan dinner. No mess, no fuss just a tasty, healthy roasted salmon dinner! I wasn’t sure at first when I saw sheet pan meals appearing everywhere. I’m one of those people that like my food to be separated from each ingredient as it cooks. So having everything on the same pan made me a teeny bit nervous. But this is salmon, and salmon is a big family favorite in this house. 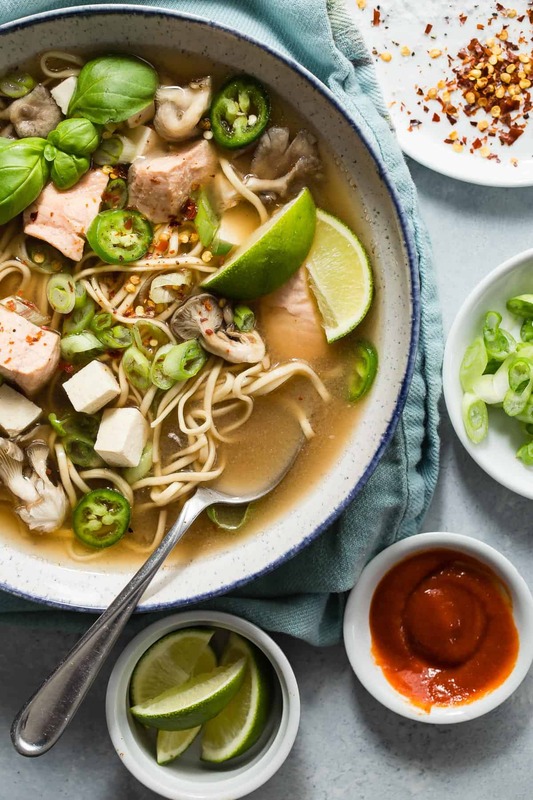 It’s one of the easiest ingredients to cook with and always ends up being amazing. 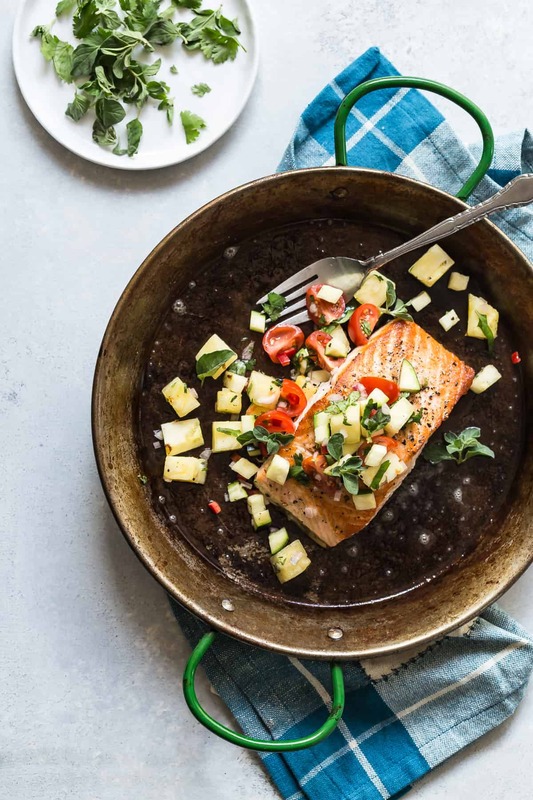 One of the most popular posts on Foodness Gracious is this Cast Iron Skillet Seared Salmon and it’s really simple but searing the salmon in your cast iron pan is what gives it that special crust on the outside but keeping all of the juices inside. So to have two or three ingredients on the same pan is working out to be a no-brainer actually. It’s less preparation, less mess and ends up being quicker to get a healthy meal on the table for the family. It’s a total win-win for everyone. 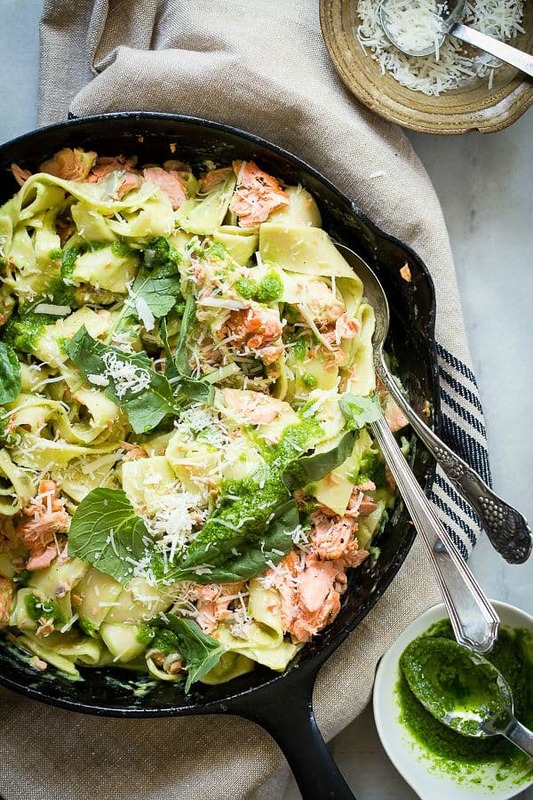 Can I use any salmon for my roasted salmon sheet pan dinner? In my opinion, any salmon is a good start to a better way of eating. 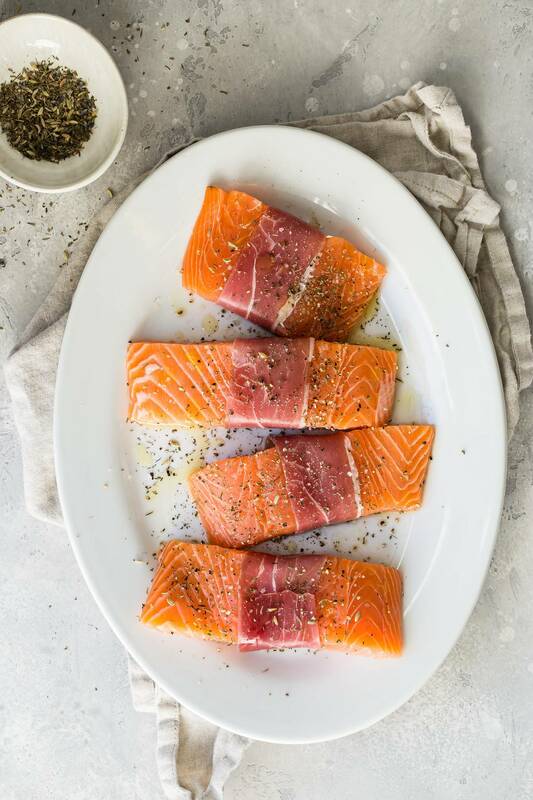 Of course, there are different types of salmon available from $5 per pound up to higher than $20 per pound so quality definitely varies in price. The more expensive the salmon usually means the better it’ll taste. Farmed salmon can have a hard life raised in cramped nets and you’ll be able to tell when you taste it against a more expensive piece of salmon. Any fish or animal will always taste better if it was raised naturally and not forced. I usually try and buy Alaskan salmon, especially Copper River Salmon if I can find it. It’s wild and will taste better than the other choice you’ll see more often available, which is farmed Atlantic salmon. If you can buy fresh then I’d say make that your first choice but don’t be turned off by frozen salmon. A lot of salmon ends up being flash frozen anyway, just let it thaw overnight in the fridge for the next day. After I unwrap it I like to pat it gently with some paper towels just to soak up that excess water you’ll get from a frozen fish. Should I take the skin off before making my roasted salmon? I like to keep it on because it makes it easier to handle when you’re cooking it, I also think it adds to the flavor. I always place my salmon in a really hot pan with the skin side up first to get a nice crust and then flip it so that it finishes cooking in the oven with the skin side down. 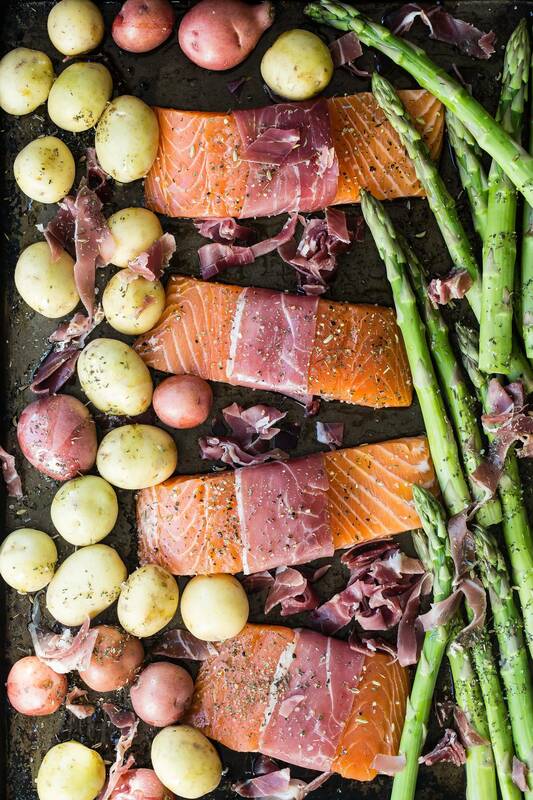 With this roasted salmon sheet pan dinner though, all you need to do is place it on the pan after wrapping some Italian prosciutto around the center. A light drizzle of olive oil and a hot oven is all you need! I added some baby potatoes, which cook much faster than regular russet potatoes, and asparagus to complete the sheet pan dinner. What else can I cook with my roasted salmon? 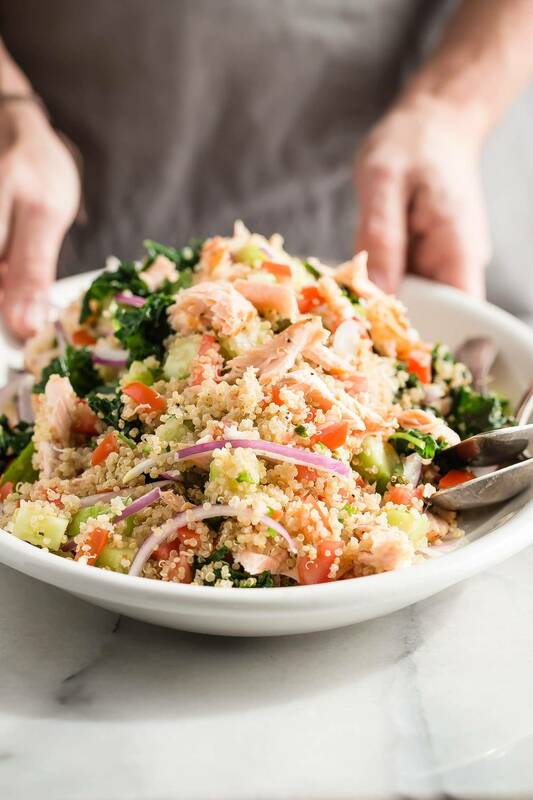 Any vegetable is fair game, but if you have to chop it up, make sure it’s no bigger than 1 inch cubed or you’ll bite into some juicy moist salmon and veggies that might be hard in the center. Eggplant, zucchini, red onions, broccoli, and cauliflower are all great choices. Also, make sure to give all of the veggies a shuffle with some tongs about halfway through cooking so that everything gets nice and evenly caramelized. 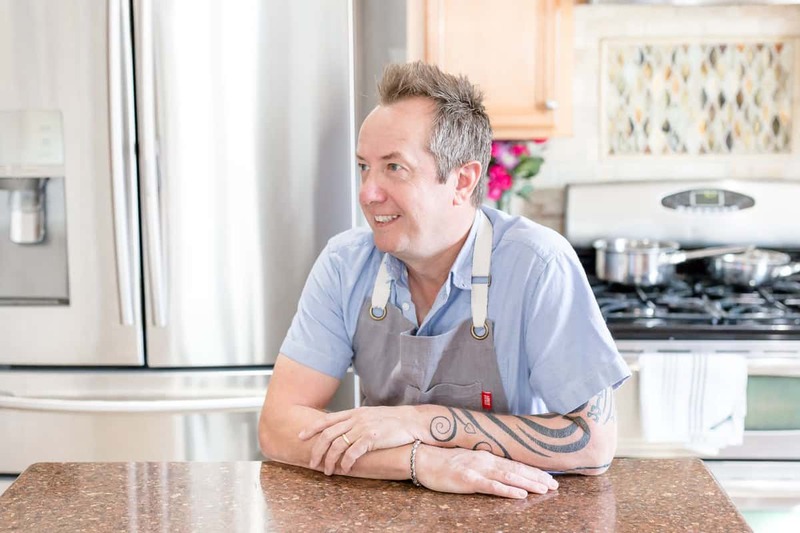 Check out some of my other favorite salmon recipes! Click on the image to find the recipe! A delicious and easy sheet pan dinner that can easily feed the family! Roasted salmon with baby potatoes and asparagus! Slice the salmon into four even pieces. Wrap each slice of salmon with two slices of the Prosciutto ham and place in the center of a large baking sheet pan. Add the baby potatoes to one side of the salmon with the asparagus on the other side. 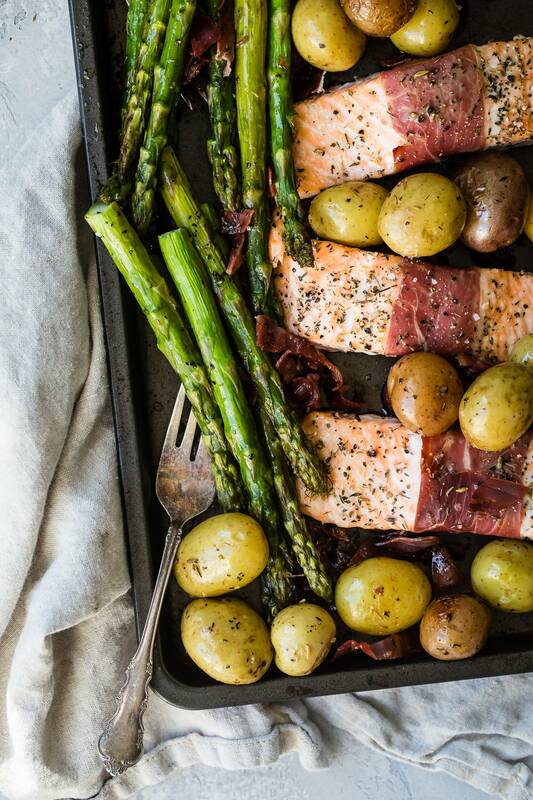 Drizzle the olive oil over the salmon, potatoes and asparagus. Sprinkle the dried herbs over everything and season with some salt and black pepper if desired. Place the pan in the oven and bake for about 25 minutes or until the veggies are a little bit charred and the salmon is slightly tender when pressed with your finger. Such a stunning sheet pan dish!